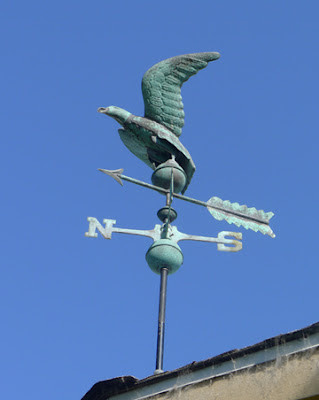 Yesterday a friend installed my weather vane so the eagle flies. It's one of the last symbols of my relocation, a multi-layered icon of significance. Richard studied with a shaman the last few years of his life and the eagle was his totem. The last house we moved into had this weather vane on the roof so when I left, I took it with me. I like having something that tells me "what direction the wind is blowing" literally and metaphorically. Combined with my GPS, which tells me what direction I'm going, this clarity should make decisions in my life become easier. Animal medicine states: Eagle medicine is the power of the Great Spirit, the connection to the Divine. It is the ability to live in the realm of spirit, and yet remain connected and balanced within the realm of Earth. Eagle soars and is quick to observe expansiveness within the overall pattern of life. From the heights of the clouds, Eagle is close to the heavens where the Great Spirit dwells. How perfect is that! A constant reminder to stay grounded while being able to see all around me and continuing to walk in spirit. Great Weather Vane.. My husband also has the Eagle for his totem, and we have had some interesting occurrences with Eagle. I saw a photo yesterday of an eagle that was snuggling with its owner. My son's totem is the raven, if I recall correctly. D. studied with a shaman at NYU. The way you value your weather vane is amazing. Yes, we all need a guide as we go on with our lives. Eagles, if I may add, are also a symbol of freedom and authority. It's certainly a sound choice to have an eagle perched on your roof. Thank you Willie for your comment. It was perfect timing to remind me of the significance of this icon.